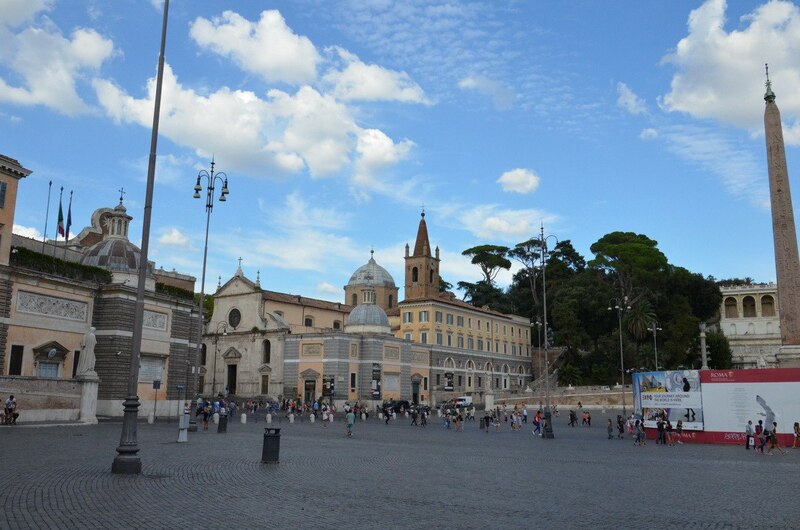 Bob and I seemed to find ourselves drawn to Piazza del Popolo a few times during our stay in Rome. From our hotel, we could walk to this large pedestrian zone within minutes and always found something of interest to investigate. 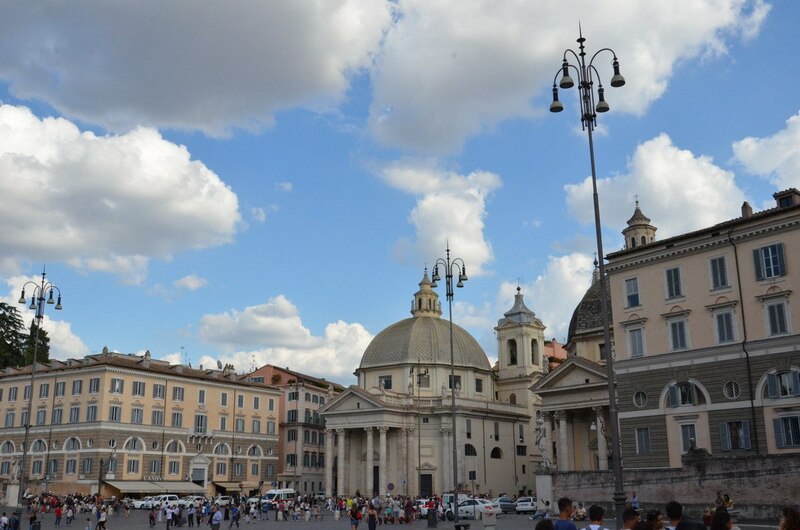 Known today as the People’s Square, its name originally was a nod to Santa Maria del Popolo, the yellow church that sits on the northeast corner of the piazza. The church was named in recognition of various species of Poplar Trees, one of which grew nearby when the church was under construction. 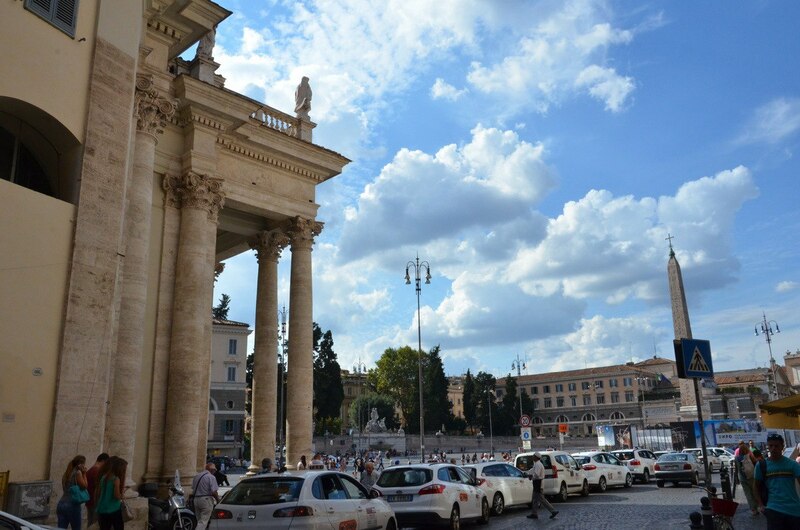 Our first glimpse of Piazza del Popolo was a lineup of taxis bumper to bumper waiting for a fare. Being a gathering place for throngs of people meant ample opportunities for some business. The abundance of taxis was a huge improvement over what used to ensue in the Square. In the not so distant past, Piazza del Popolo still catered to vehicular traffic so was either choked with automobiles passing through or with those parking in every available slot. It would’ve been very busy in terms of people moving about. 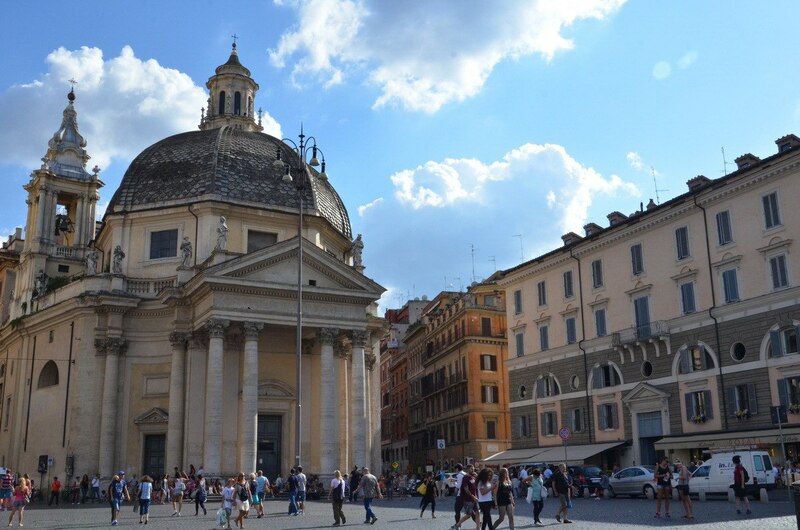 When we first entered onto the square by Via del Babuino, we faced both Porta del Popolo and Santa Maria del Popolo on the north side of the piazza. 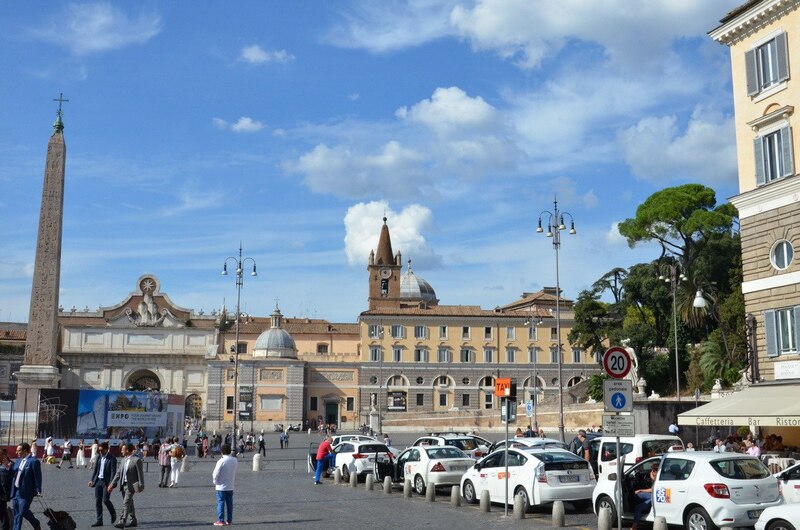 In the beginning, Piazza del Popolo was a conduit for all traffic moving north through Rome towards Rimini . Via Flaminia was the most important road in ancient Rome having been constructed to connect Rome to Rimini on the Adriatic Sea. It begins just outside the Porta del Popolo, the exit gate in the northern portion of the Aurelian Wall. 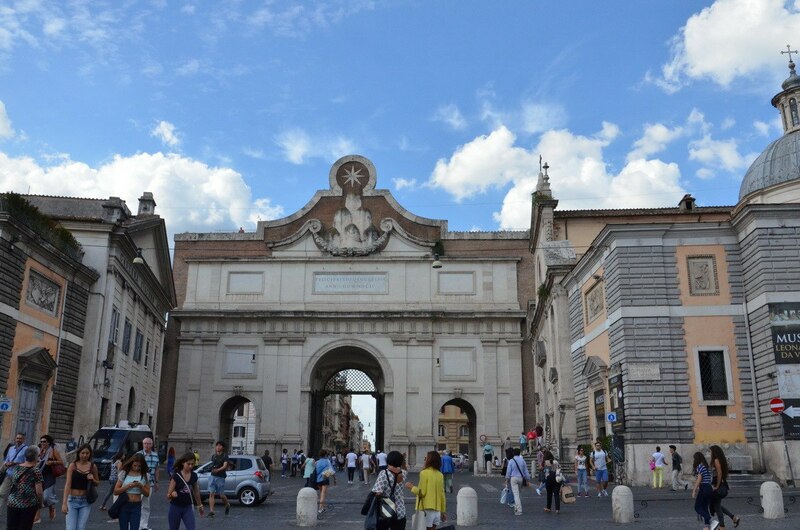 Porta del Popolo was also the gate through which anyone traveling to Rome from the north would have entered the city. 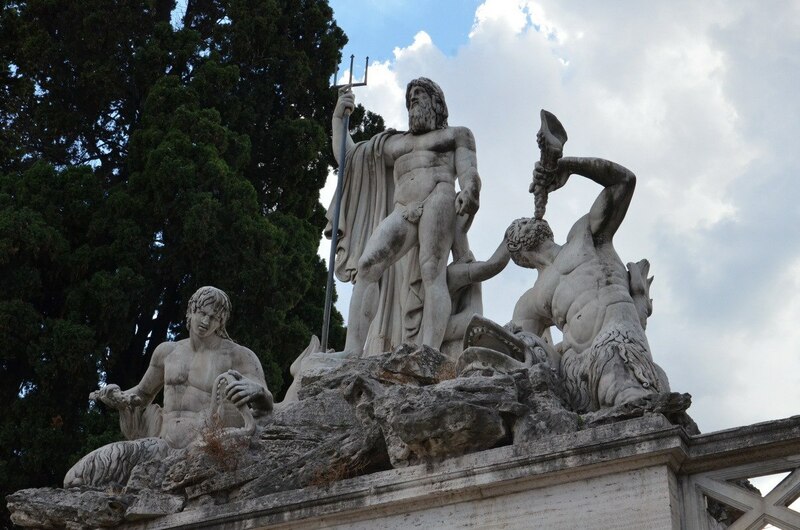 Early travelers probably hoped for some entertainment or mere titillation to spice up their journey because Piazza del Popolo had gained a worldwide reputation for the public executions, festivals, tournaments and fairs that took place there. Such public demonstrations ended in 1826.
and to its right, Via del Corso, the road that separates the two churches. Construction of Santa Maria dei Miracoli (on the right) began two years after work had begun on its twin, but in scrutinizing the facades, it becomes obvious that there are significant differences between the two. The churches are symmetrically balanced but still provide variety in their details. And we were impressed by the architectural detailing built into both churches especially the elegant bell towers and octagonal cupolas that embellish the circular exteriors. The third street to exit Piazza del Popolo on the south side is Via di Ripetta seen here to the right of Santa Maria dei Miracoli. 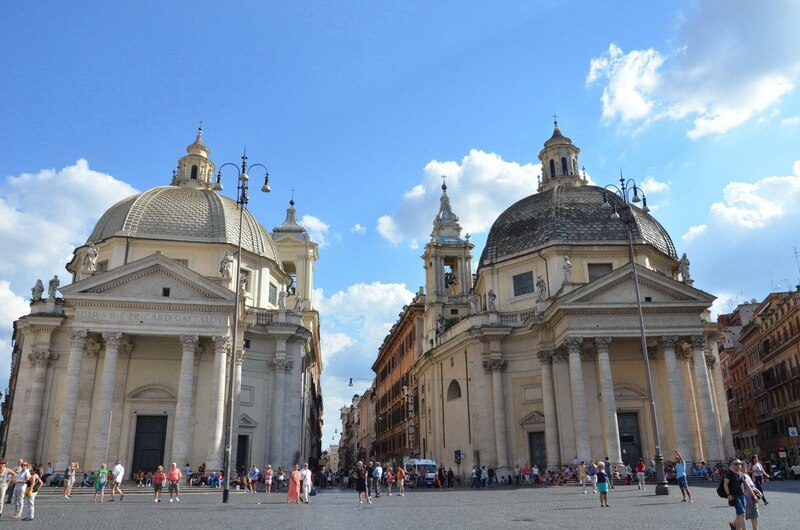 This street, that completes the trident of streets that converge on Piazza del Popolo, connects directly with Piazza Venezia, the Roman Forum and the Capitol. One evening after Bob and I savoured a 4-course meal alfresco on the Square, we lingered nearby to watch the comings and goings of pedestrians. The Fountain of Neptune made a good spot from which to observe Piazza del Popolo as it is situated along the west side of the Square, and handy seating comes in the form of a low semi-circular wall around the fountain’s base. The sculptures of Neptune, two Tritons and two dolphins were quite impressive and appeared dramatic backlit as they were by the bright western sky. 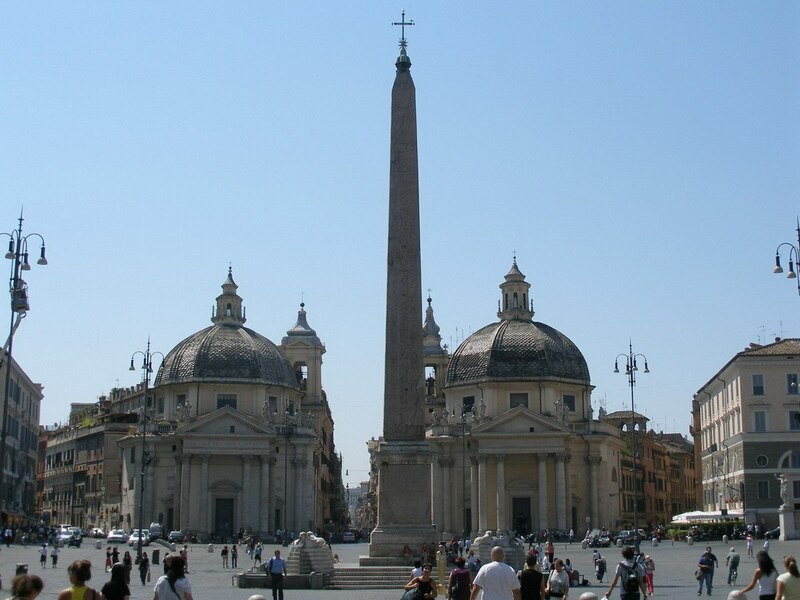 Dominating the centre of the Square, which is not a square at all but rather a piazza based on two semicircles, is the Egyptian Obelisk of Sety I. 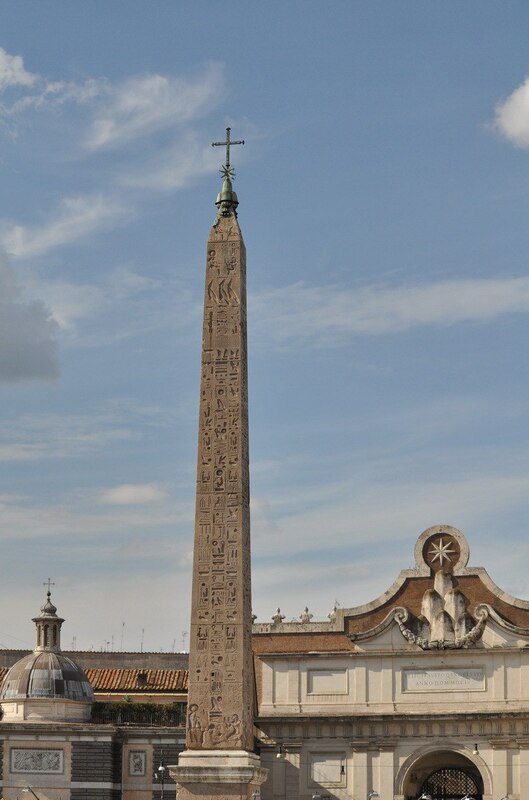 Now known as either the Popolo Obelisk or the Flaminio Obelisk, the stone pillar was relocated to Rome from Heliopolis in ancient Egypt under the orders of Augustus in 10 BC. 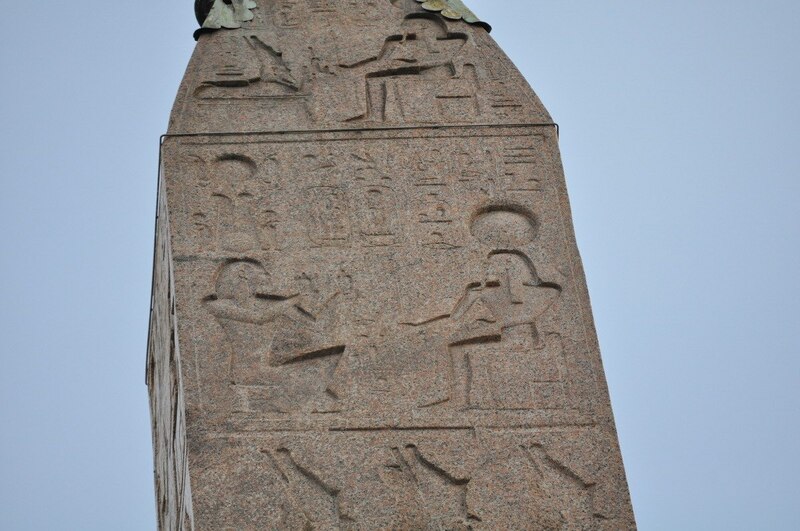 The Egyptian Obelisk of Sety I features Egyptian carvings on all four sides and is the second oldest and one of the tallest obelisks in Rome. 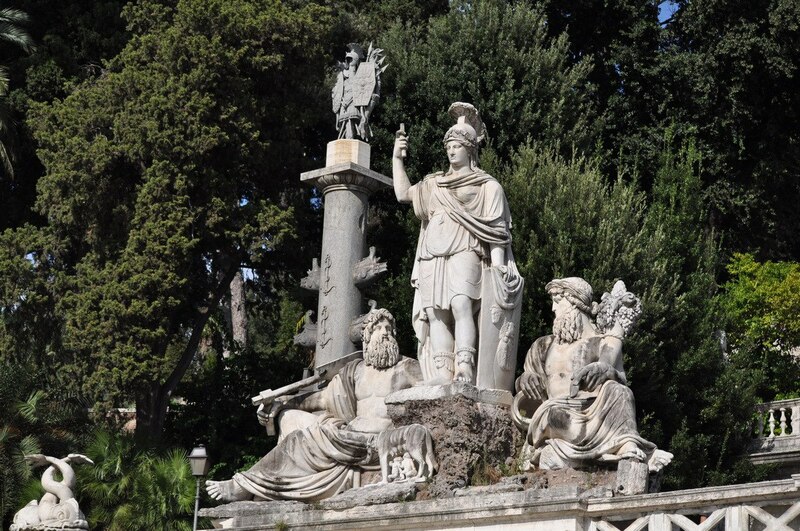 It was first installed at Circus Maximus near Palatine Hill, but was successfully moved and re-erected in Piazza del Popolo under the guidance of engineer Domenico Fontana in 1589. Owing to restoration work at the time of our visit, the four fountains at the base of the obelisk were not visible, so we turned our eyes skyward to study the carvings. Sitting at 24 metres high (almost 79 ft) plus an extra 12 metres (39 ft) allowing for the plinth, the Obelisk had us looking up, way, way up. it is actually the clever plan set forth and implemented by the engineer who designed Piazza del Popolo, Giuseppe Valadier, that most impressed me. 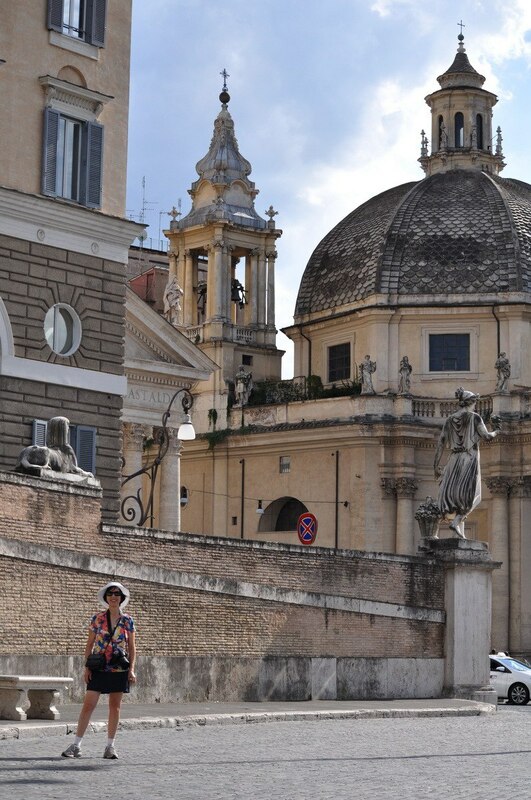 Giuseppe utilized the slope of Pincian Hill to link Piazza del Popolo with Pincio Park at the top of the hill. Unseen from below is a street or viale that doubles back on itself to scale the hill; it is hidden by clever architecture that appears to be an extension of the fountain. Pedestrians have available to them a staircase that passes by a waterfall for when they want to walk up the side of the hill. 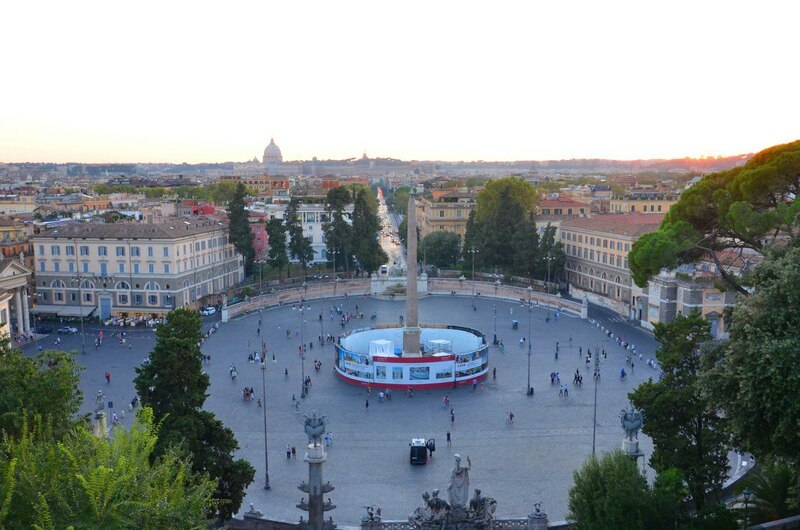 From Pincio Park, visitors have a marvelous view of Piazza del Popolo while standing on top of a neoclassical styled nymphaeum crowned with a substantial balustrade. 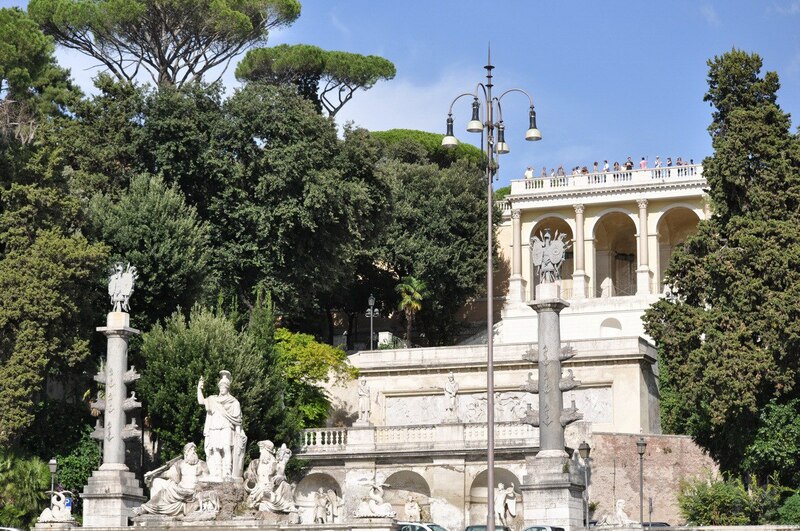 Both fountains and the nymphaeum were designed to beautify Piazza del Popolo and were installations planned to celebrate and showcase the availability of freshwater made possible by the completion of the newly-built aqueduct in the 1820s. The perpetual flow of water in the fountains was intended to commemorate the success of that achievement. 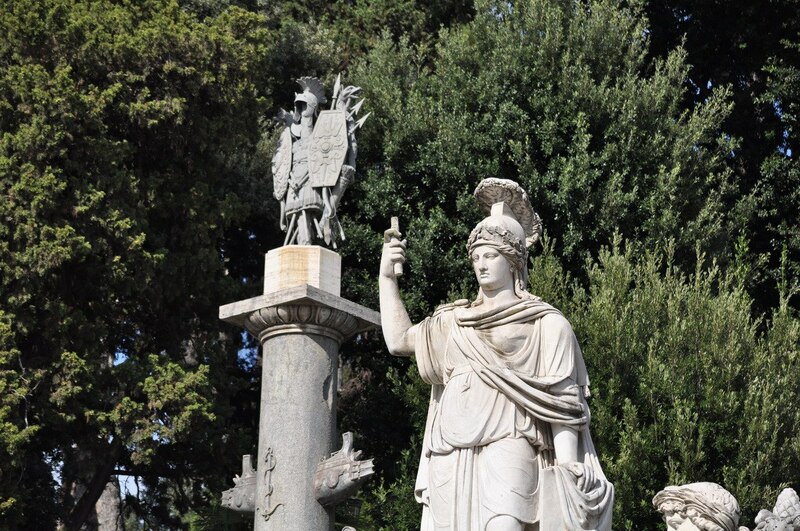 As I already mentioned, there are four additional fountains at the base of the Egyptian Obelisk, and Valadier had also planned fountains up the side of Pincian Hill, but he could not get the water to reach to that height. The shaded staircase set into the side of Pincian Hill made for an intriguing after dinner stroll on another evening, and that is when we discovered that the genius of Giuseppe Valadier was not limited to the space of Piazza del Popolo but extended to the expanse of a wide open space in Pincio Park into which pedestrians emerge from the treed slope. 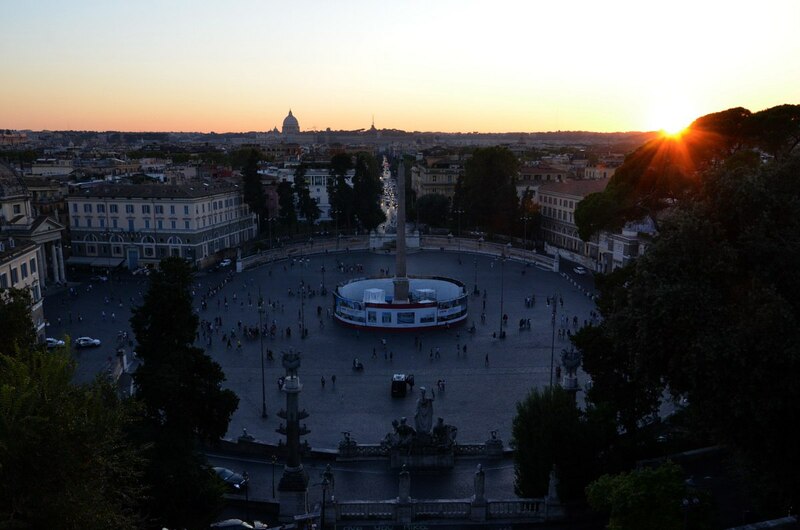 It is set on the same axis as the piazza below, is circled by the artful placement of trees and yields one of the best views of the city at sunset. That is where we watched one day draw to a close in the company of many other couples taking in the view as the sun went down.